School Board Meeting 10/24/12 Please attend! The administration will also share their “modeling” criteria for different scenarios (e.g. closing an elementary school), communication, and next steps. Elementary school parents are encouraged to attend so that they can hear first-hand the details of all proposals being considered by the administration and the school board. For the second time this month, the North Allegheny School board got an earful from elementary school parents who say they are frustrated by increasing class sizes and fearful the board will close at least one elementary school. At the most recent meeting Sept. 19, more than a half-dozen parents waited nearly two hours to address the board at the end of its regular agenda. 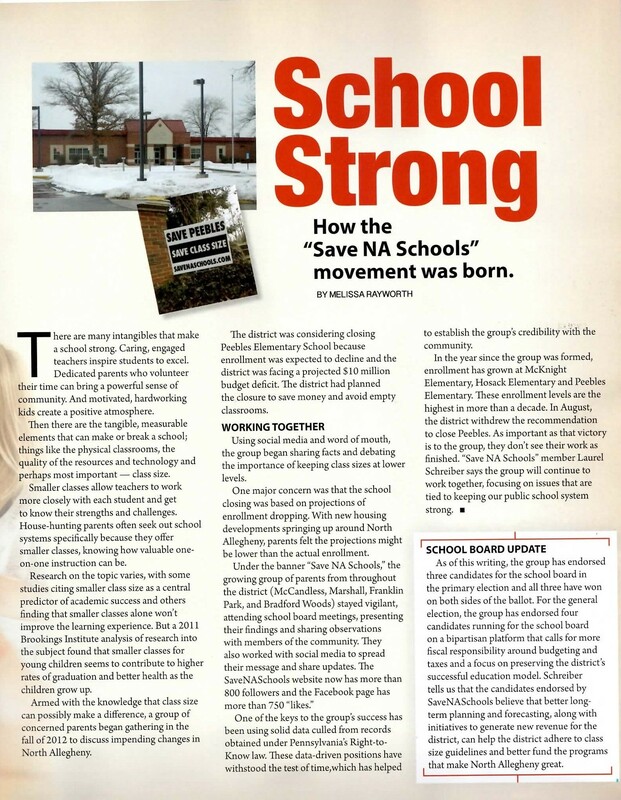 “My daughter goes to Hosack Elementary. Her class has 32 students,” Bill Lungren told the board. School board member Linda Bishop said the district has increased class sizes to help balance its current budget. Kevin Mahler, who said he was speaking on behalf of a group of concerned parents, said he believes class size will inevitably impact the quality of education for the children of North Allegheny. “As the cliché says, perception is reality, and there is an overwhelming perception that people like smaller class sizes, especially parents when they are choosing a school district,” he said. Mahler said he wants the district to clearly define a policy and set limits for class sizes, particularly in the elementary schools. Amanda Hartle, communications coordinator for the North Hills School Districtclarified that in grades K-1, that district’s maximum class size is 20 students per class with a single teacher, or 23 students with a teacher and a teaching assistant. In grades 2-3, the maximum is 23 students per class with a single teacher, and 25 students with a teacher and teaching assistant. In grades 4-6 at North Hills, the maximum is 25 students per class with a single teacher, or 27 with a teacher and a teaching assistant. Many North Allegheny parents also expressed the desire for the board to form a community task force to discuss solutions to larger classes as well as the recommendation last month from consulting firm Thomas & Williamson that Peebles Elementary be closed to equalize elementary enrollment. “Let’s work to find lasting solutions and not Band-Aids to our budgetary problems,” said Chris Disque, a North Allegheny parent. Before the board can vote to close a school, it must hold at least one public hearing, advertised at least 15 days in advance. The board cannot vote for at least three months after the hearing. Board President Maureen Grosheider said the board will have new demographic data at its next meeting that could potentially impact recommendations about any potential school closings. That meeting is scheduled for Wednesday, Oct. 24. 1) The mathematically inaccurate conclusions and questionable projections included in the Phase 2 Demographics & Feasibility Study. 2) The ability of the remaining 6 elementary schools to provide adequate capacity for all elementary school students without an increase in class size. 3) The lack of financial data related to both the cost savings from closing a school and the future costs that would need to be incurred with respect to repairs and renovations at the remaining 6 elementary school buildings. We do not believe that closing an elementary school is the solution to the district’s budgeting problems. We believe more time and resources are needed to explore all viable long-term solutions. 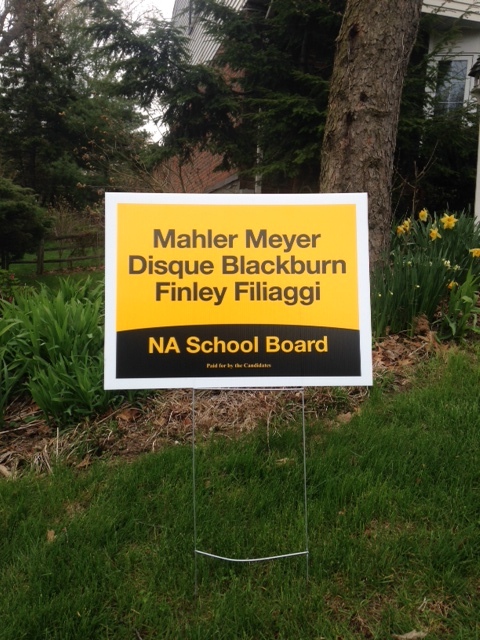 We have petitioned for a community task force that would involve the entire district in helping brainstorm proposals that will keep North Allegheny the school district of choice based on its excellence in education. Please help support us in this endeavor by signing the petition for a community task force, attending monthly school board meetings to stay informed, and getting your friends and neighbors to join our Facebook page. You are invited to attend the Superintendent’s Coffee. Attendance is not limited to NA parents– but is open to the entire community. • Hear an overview of key information for parents. • Q & A will close the session.